This Aperture tutorial is all about straightening photographs. It is pretty simple to do and doesn't take long to do each photograph. Please bare in mind though you do need a fast-ish computer if you want to do these quickly as it take a couple of seconds for me for the image to initially update. This was quiet funny as many of the image were even worse than before. If I had hundreds of these to do I might use a Mac Pro to easily cut through the photos, my Mac Book Pro struggled a little till I got the hang of waiting. I could of course just take the photos straight to begin with. Anyway rotating photos could not be easier in Aperture, all it involves is finding a dogey photo, clicking the straighting icon, move the mouse up and down and watch it as the photo rotates. I will show you through the steps. You will notice that a grid comes up on your image, click and drag your mouse forward and backwards to line up the image. 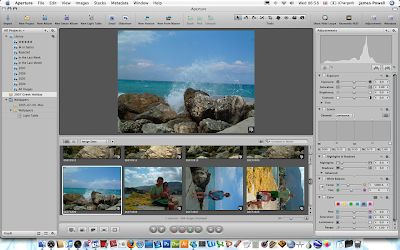 Aperture automatically rotates and crops your image for you. When you done let go. 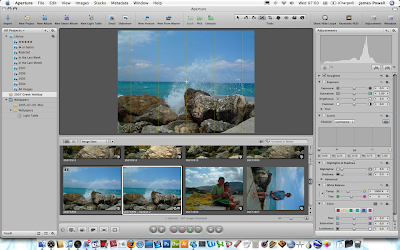 As with anything in Aperture a Stack is created. You are done and ready to move onto the next image. Thats all for this quick tip in Aperture. You can see the rest of the series here.